I wake up to the faint sound of early morning traffic starting to roll slowly through the empty streets of Downtown Seattle as the occasional bark from a dog can be heard from somewhere in the distance. Nearby, just a few blocks away, the now empty Convention Center stands as a shell compared to the hive of activity that it was over the last week. The last day of the Summit has been and gone and I feel just a hint of sadness that my time here in Seattle and the U.S.A is almost over but can at least start to think about the end of 2014 and look forward to good things in 2015. 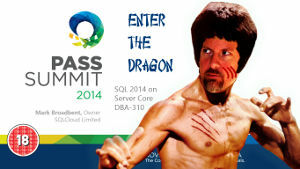 My day had started out pretty much as it had done for the last couple of days, since I had one last thing to accomplish, which was to present my session Enter the Dragon – SQL 2014 on Server Core. I spent the early morning in my room attempting to prepare since a lot of my focus this trip had been to finalize the Community session. As the time approached I made my way into the Convention Center and started to set up my session. I was a little taken aback by the size of the room, and I felt at the time that someone had misunderstood the popularity of the subject matter (I personally think it is still a niche dry subject), but no matter, I was happy to be proven wrong (I wasn’t). The size of the room did not really help when it came to demos either, since Server Core is after all not much more than a command prompt to look at. It also did not help that I was losing significant screen estate on the projector, so when I increased my resolution I lost the sides. The AV guy managed to reconfigure his AV Control Box and although it wasn’t perfect we managed to improve the situation to an acceptable level (all bar a few missing pixels). I found it surprising that, even in a room that size with so much available space, people were still intent on sitting at the back and away from other people – come on guys talk to one another! I felt the presentation went ok, but I don’t think it was my finest hour. A couple of jokes fell flat and it is a presentation that I have always struggled to get through the whole set of material and I was determined to do so this time, since I believe the latter part is the most valuable. Sadly this meant me talking through a couple of demos to save time, but in hindsight I don’t think this is such a bad thing and provided no less value than executing the commands onscreen. I did get through the material almost on time, but it has given me food for thought about whether I make further cuts to some of the earlier material, which is aimed primarily towards Windows Administrators so that they can be convinced a switch is necessary. Despite my disappointment over this session, I am still continuing to hear great feedback about the Community one I gave yesterday with Buck (he is getting this too), so at least I can feel pleased about this. Once the session was over, I headed off towards the Speaker Room to wind down and reflect on the session and what I was going to do next. I eventually dropped my bags off at the hotel and came back to the Convention Center, where already it was starting to thin out substantially. I hate these specific times at conferences when these places transform from dynamic vibrant hubs of activity into a quiet sparsely populated shadow. I chill-axed in the Community Zone for a while, which was really one of the last places that people were milling about and sat there for a while, chatted to a few people and then eventually attended the Speaker Idol contest. I think that while it was a very fun and enjoyable thing to attend, I do seriously question it’s purpose. If it is aimed at giving someone who does not regularly speak at conferences a guaranteed speaking place at next years Summit, then it failed. All four finalists are regular speakers on the circuit with various experiences, and although this did not meet the aim of Speaker Idol as far as I understand it, their experience at least meant that we had a more enjoyable final -with four strong presentations. Special Mention goes to the eventual winner Pieter Vanhove from Belgium who gave an amusing presentation on CMS. Later on, a group of us headed to the Tap House and grabbed some drinks. The intention was that we were going to head off to a prearranged meal, but were waiting to be picked up. As time went on, the details and certainty of what we were doing and whether enough tables have been booked for everyone started to change, so I decided I wasn’t going to spend any more time playing guessing games (been there too many times) and instead said my goodbyes and hooked up with some of my friends in the Yard House for a huge meal. I was so exhausted by the end of the meal that I kept nodding off, and we all then decided to grab some sleep so headed back to our Hotels. I’ve had a great time here at the Summit 14, but there has been several regrets, one of which is that due to the shear number of things I have had to do, I have not really managed to speak to sponsors or do a whole list of other things I intended to. Never mind, I suppose this is a reason to attend next years Summit! Well I hope you have enjoyed reading 5 Days of PASS as I have enjoyed writing it, I am signing off now for another year, and hope to see you then.